Foot Wise Podiatry is in a rural Northamptonshire village called Woodford Halse, between Banbury and Daventry. It is sign posted 2 miles from the pair of mini-roundabouts at the centre of Byfield on the A361. 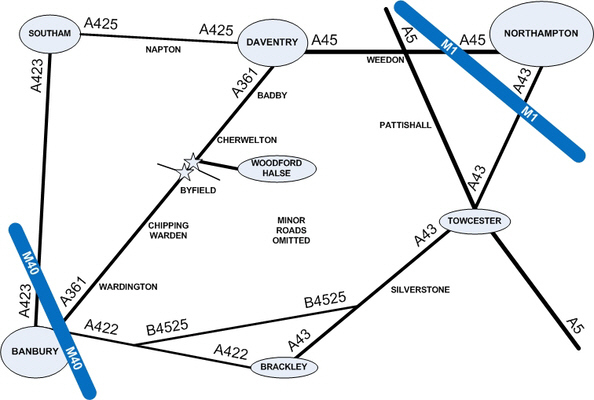 From the other direction, you can reach Woodford Halse from Canons Ashby on the old Banbury to Northampton road (the A43 from Brackley through Silverstone to Towcester and Northampton now takes this traffic). Foot Wise Podiatry is 11 miles from Southam, using a cross-country route via Priors Marston to Byfield. 22 Station Road, Woodford Halse, DAVENTRY, Northamptonshire. NN11 3RB. Telephone number (with answer machine) is 01327 260899. When entering Woodford Halse from Byfield, you first pass the fire station on your right side. After the set-back houses on your right, turn right into Phipps Road. Pass the Co-Op store on your left and go down the sharp, 90 degree left bend in front of the old Station Hotel (now a Social Club). This is now the lower end of Station Road. Follow the sharp bend left, across the brook, under two railway arches and up the hill. Foot Wise Podiatry is half-way up the rise on your left, before you reach The Green and Faulkner's Footwear to your right. Foot Wise Podiatry has its name emblazoned on a mauve and white canopy on your left side, going up the hill. A regular bus service passes our front door every hour: the Stagecoach Service 200 via the A361 between Banbury (outside Debenhams) and Daventry. Free on-street parking is available. If there is no space when you arrive, usually by the time you have turned around, someone will have moved away to make space for you! There is an 11cm step at the entrance to the clinic, accessible by wheelchair with assistance. All of our facilities are at ground level. Unfortunately, the loo is rather narrow and is not wheel chair friendly.